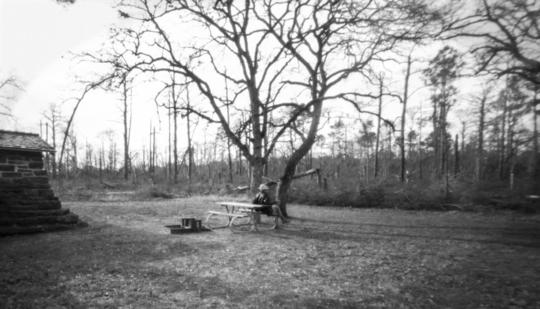 Terri St. Arnauld and Frank Yeezer, Ashes, pinhole photograph on 120 film, 21" x 12"
Terri St.Arnauld & Frank Yezer, residents of Austin, Texas, US, work closely together to process and print all of their black & white and platinum work. More recently, they have included digital photography, processing and printing in their portfolio. A love of travel, even around Austin, has inspired much of this couple’s work. St.Arnauld & Yezer’s work has been shown in Austin, around Texas, including participation in FotoFest 2010, and in several international group shows. Some of their work is included in the collection of the University of Texas Harry Ransom Center, the City of Austin, and numerous private collectors. St.Arnauld began practicing photography as an adolescent, but did not actively study it until after college. Classes, workshops and seminars have been interspersed with a predominantly autodidactic curriculum. She has always enjoyed visually studying people and places and likes the creative expression that photography allows while doing this. Yezer became interested in photography as a ballet dancer with a touring company. But it was not until he later made a number of trips to France that he really started to learn the techniques. His combined interest in technical skills and art has taken him from ballet to bookbinding to photography. This work was inspired by a musical piece that gave us a sense of memory and dreams – what was and what might be. 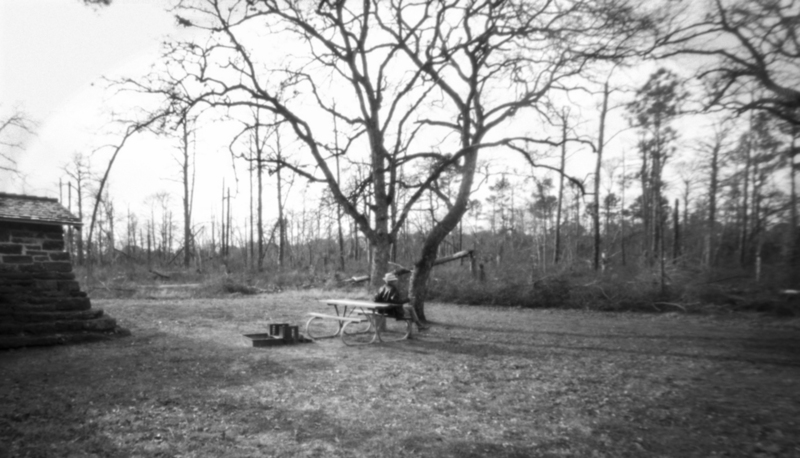 That led us to work with a pinhole camera for its depth of field in the center and softer focus toward the edges, to create a dream-like image shot in a fire-damaged area near Bastrop, Texas. It was an enjoyable challenge that was neither difficult nor easy. We spent many days listening to the piece we were sent, trying to understand what the artist was conveying. We found ourselves very involved with the musical artist’s interpretation. (Were we getting it right?) Then we realized that we never look at any art that way. We either like it or we don’t. Sometimes we don’t even agree on that but, in this case, agreed that we both liked the piece. We began to talk about how it made us feel, what we liked and what were some of the elements that tied those things together. That is what we tried to put into our work.